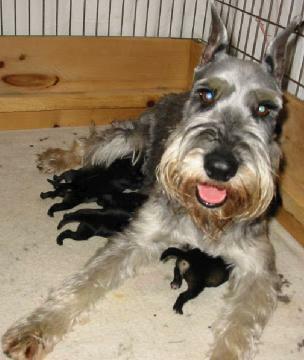 We have owned Standard Schnauzers since 1985 and have been breeding under the registered name of Schattentier since 1989. 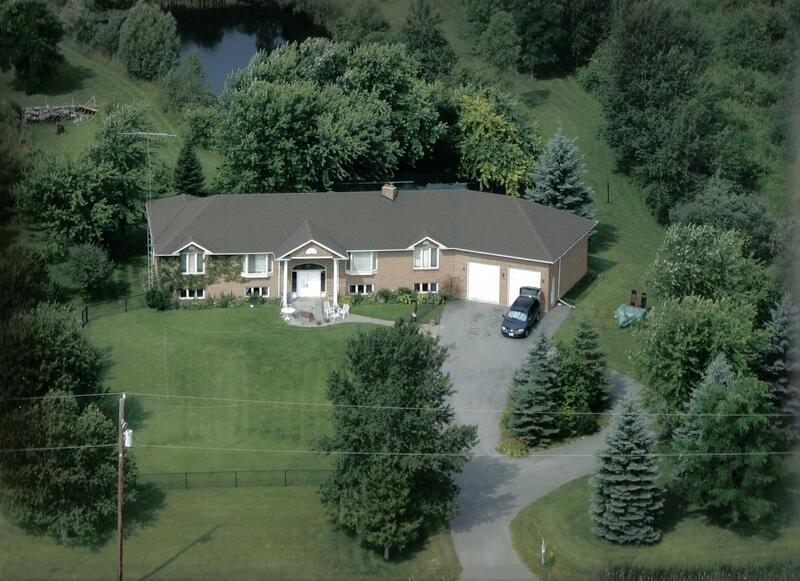 We are a fairly small kennel operation with dogs that are kept in-house. Our dogs are part of our family and although they do spend a part of each day in their crates for rest periods, the dogs all participate in their share of family life with us. They love to 'help' while we work, play, read, watch TV, etc. They all spend their nights in someone's room. They love car rides and are thrilled to go visiting or have visitors come here. We live on nearly 6 acres, so besides the exercise they get in our sizeable runs, the dogs also get a chance to enjoy walks with us or just go for a romp on the lawn with the kids. 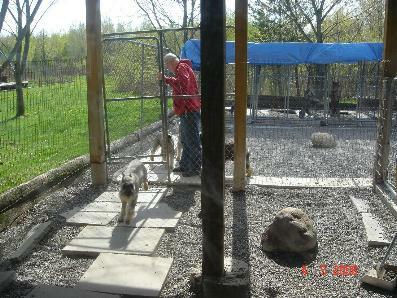 Presently, we have a number of dogs here ranging in age from several months old to 6 years. All are Canadian Champions or are currently working on their Championships. Some of our dogs have retired from showing and breeding and now live with friends and family. We also co-own several dogs that live with their other families. We are very pleased to say that the pups we have produced all bring great joy and love to their families. 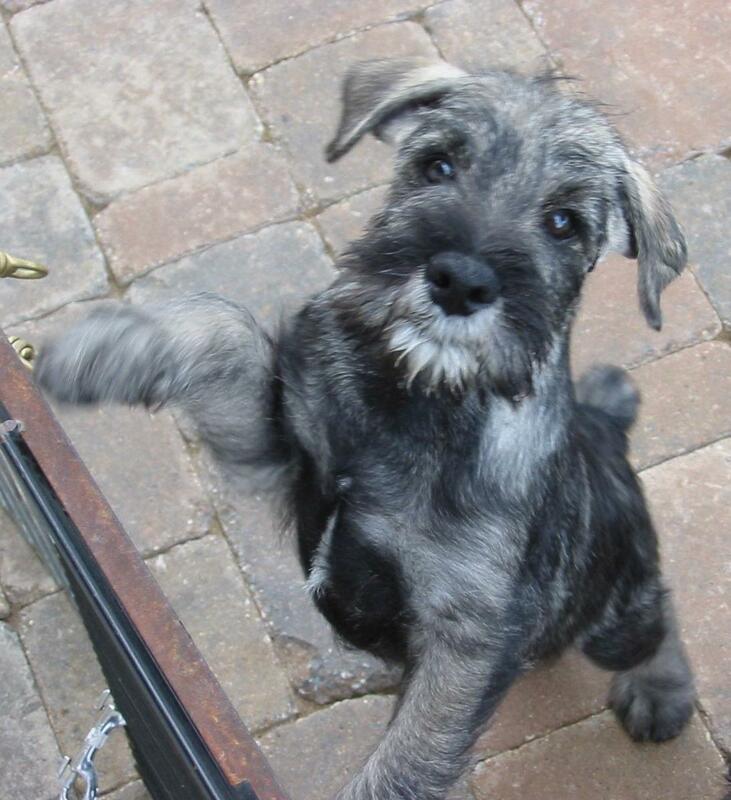 Over the last few years, several of our pups have become the second Schattentier Standard Schnauzer in the household. Although we are a fully licensed kennel and a registered business in Ontario, we are not open to the public and will only take dogs from our own breeding in for boarding or for grooming. We feel this is important for the health and well-being of our own dogs and allows us to give our 'guests' knowledgeable and loving attention because they are really still 'part of our family'. Our puppies are whelped and raised in our kitchen. We find that this works out very well and pups are always at the center of our attention. They get used to the hustle and bustle of our busy household and have little trouble fitting into their new homes. Pups are nearly house trained by the time they go home, and we feel this is because pups get more attention being so close to family living. 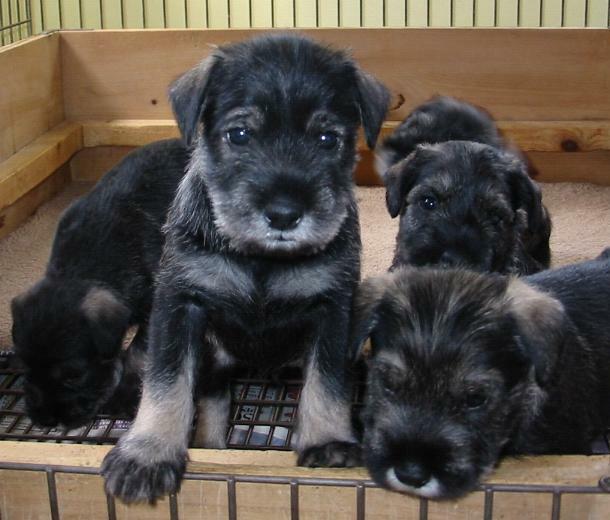 We breed selectively as we believe strongly in producing quality puppies with excellent temperaments. We will not breed just to produce pups for sale. This season will be devoted to another new generation of Schattentier babies many of which will go to homes like yours. We make every effort to insure that they will be wonderful companions. We begin that task here and are always available to assist our families once the pup goes home. We consider our purchasers to be part of our extended family and expect them to stay in touch. With the advent of e-mail we have been able to really stay in contact with our families both before and after the puppies go home. We recently purchased a digital camera and were able to send pictures along with the weekly reports to our new families. This really helped them feel a part of the whole 'new puppy' process. In fact, it was so successful we plan to continue doing this with all our future litters. Pups go to their new homes with a writen guarantee. Vet checked, first shots, fully wormed .